The EPA FT4/EU Stage IV engine employs field-proven cooled exhaust gas recirculation (EGR) for reducing NOX, and a diesel particulate filter and diesel oxidation catalyst to reduce particulate matter. Ash-service intervals for the diesel particulate filter (DPF) are condition based, with the machine notifying the operator before service is required. Highly efficient heavy-duty cooling system keeps things cool, even in tough environments or high altitudes. Cool-on-demand suction-type fan helps reduce material buildup and maintenance. Ergonomically correct short-throw pilot levers provide smooth, precise fingertip control with less movement and effort. Optional sliding switch provides proportional speed control. Press the power-boost button on the right-hand control for extra digging power. Power boost also kicks in automatically in boom-up/lifting functions. 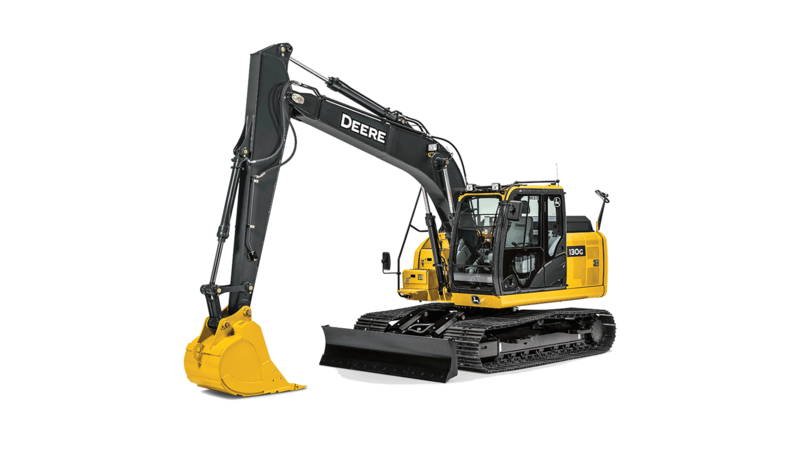 High-productivity delivers more power and faster hydraulic response to move more material. Wide expanse of front and side glass, narrow front cab posts, large tinted overhead hatch, and numerous mirrors provide virtually unrestricted all-around visibility. Large hinged doors provide wide-open access to service items. Lube banks, filters, and checkpoints are grouped for added convenience. Durable booms, arms and mainframes are warranted for three years or 10,000 hours.